Matt Olson hit a leadoff home run in the 10th inning after a video review gave Oakland the tying run in the ninth, and the Athletics beat the Houston Astros 4-3 on Friday night to pull within a game of the reigning World Series champs for the AL West lead. 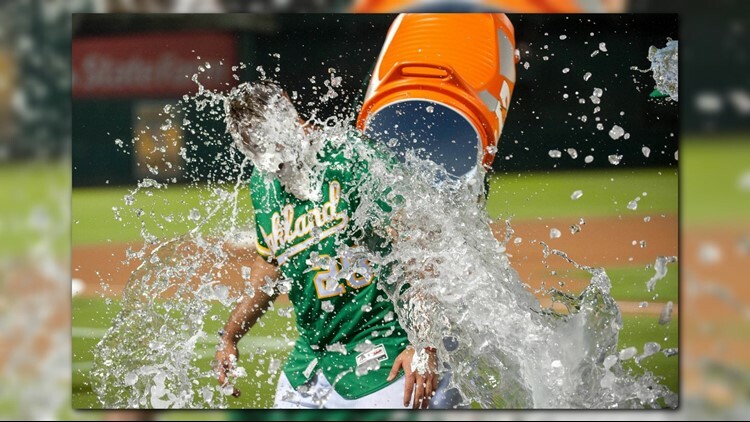 OAKLAND, Calif. (AP) - Matt Olson hit a leadoff home run in the 10th inning after a video review gave Oakland the tying run in the ninth, and the Athletics beat the Houston Astros 4-3 on Friday night to pull within a game of the reigning World Series champs for the AL West lead. That came an inning after Oakland baserunner Ramon Laureano narrowly beat the tag at home from catcher Martin Maldonado for the tying run. Laureano took off from first on Nick Martini's double to the wall in right field, testing the arms of outfielder Josh Reddick and relay man Carlos Correa. Laureano was initially called out on the play, but immediately called for Oakland to challenge the call. Reddick singled in the go-ahead run in the sixth inning against his former club after Alex Bregman and Maldonado each hit solo home runs for the Astros. Houston has been alone atop the AL West since June 14. Athletics: OF Matt Joyce, sidelined since July 5 with a strained lower back, took live batting practice for the second time in three days and was set to run the bases. Manager Bob Melvin hopes Joyce continues to progress but it could be September before he plays as the A's will be cautious given previous setbacks.